I made this card for the Unity Stamp Company Friends with Flair Friday Challenge. I used the new Woodland Creatures stamp set. 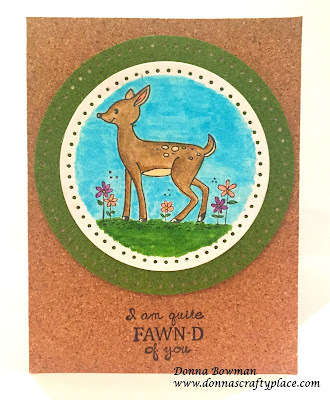 I stamped the deer on watercolor paper and colored it with Zig Real Brush Clean Color Markers. I die cut a stitched circle from PTI in green cork and I covered the card with natural cork. I stamped the sentiment onto the cork with Ranger Archival Ink. Thanks for stopping by! You've got the Zig! Awesome fun design Donna! This is really lovely & cute! Adorable card and I love the cork! Adorable card! The cork paper gives it a fun texture too! Love how you used the cork to add texture. Cute card. Cork was a great touch! Adorable deer! Such a sweet image, Donna.